Major Millions is looking to dole out some major cash. Click here to play! All you have to do to earn a piece of this progressive pie is spin the reels on this Major Millions take on the popular MegaSpin slots! As with all MegaSpin slots, there are six games of 3 reel slots, but, in this case, Major Millions has taken over. He is offering a progressive jackpot and three pay lines on each game. Spin the reels for a chance to collect three Major Millions logos across one of the pay lines and you'll win a pretty substantial fortune. Line one will get you 25000 coins, line two will get you 50000 coins, and line three will get you the progressive jackpot! 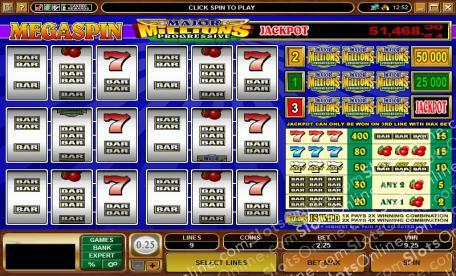 There are plenty of other traditional slot symbols in this game to help you amass a fortune. Spin three red sevens to get 400 coins, three blue sevens to get 80 coins, or a combination of the two to get 50 coins. Don't forget about the BARS and cherries as these two symbols bring in pretty good wins as well! Take a spin in on the MegaSpin Major Millions and you could walk away with a massive progressive jackpot! The Major's Millions logo is a wild symbol and will substitute for all others to help you win. If you wpin one in a winning combo, it will double your prize. If you spin two in a winning combo, it wil quadruple your prize.